One of our favorite sights up here on the mountain (besides our signature, awe-inspiring vistas or the sun setting over one of our many lakes) is the sea of cars heading through the village with beautiful new Christmas trees strapped to their roofs. It is a heart-warming signal to locals in Western North Carolina that the holidays are just around the corner. Just a short and scenic drive up the mountain brings visitors to the town of Glenville and the historic village of Cashiers for their rich bounty of Christmas Tree farms. Many of these farms will not only assist you in selecting the ideal tree for your family, but theyll even help you cut it down. Most can also provide you with fresh pine wreaths, garland and swag so your home may be filled with the heavenly scent of a mountain forest in winter. 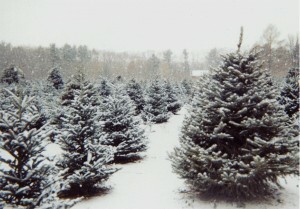 Several feature renowned Carolina Frasier Fir Trees. The folks at Silver Creek Real Estate Group invite you and your family to begin a very special new tradition together. Rather than putting up that ancient artificial tree or buying a week-old tree from a grocery store parking lot again this year, come to Western North Carolina, select your very own freshly cut Christmas tree and bring a little of the mountains home. Be sure to stop in Cashiers or Highlands to dine in one of our fine restaurants and visit our unique shops for some last minute Christmas shopping!